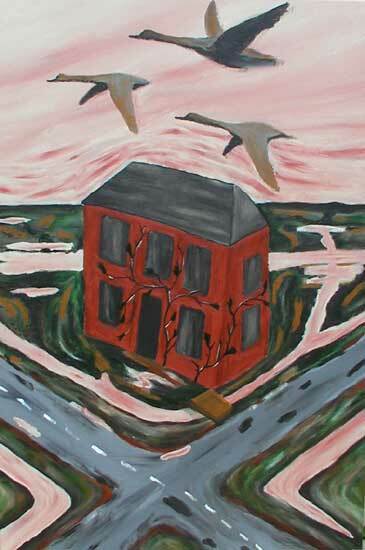 “Empty Places” is part of an ongoing series of paintings I am doing about growing up in the Mississippi Delta. I have many memories of my sister and I riding home in my father’s truck after elementary school. Daddy picked us up in Greenville after he got off work, and he usually had to rake the tools and welding rods off the seat before we climbed in. The truck smelled just like he did, like rust and mud and WD40, and it was dusty. Daddy seldom drove straight home. He would always stop by one of the little “Chinese stores” and buy some beer, and then he would head out into the countryside. He would wander down blacktop roads through the empty fields, sometimes until twilight. We all drove in silence, always, without ever making conversation. Mostly I have memories of rainy winter days, the smell of the heater and the mud on the floorboard, the sound of the tools rattling as we bounced across potholes and site of the endless flat horizon in every direction.